DRIVING THE BASKET - Friendswood's Hunter Bockart (3) drives the basket against Texas City. The Mustangs came up short 71-58 in the district contest. Bockart scored 11 points for Friendswood in the loss. DRIENDSWOOD — Texas City used offensive firepower and turnover to get past Friendswood 71-58 in a District 24-5A clash. The win improves Texas City to 7-1 while the Mustangs drop to 5-3. Texas City is tied for the district lead with Ball High while Friendswood is in fourth place. Texas City outscored Friendswood 13-10 in the opening period, but surged ahead 40-21 at intermission after outscoring the Stangs 27-11 in the second quarter as part of a 21-3 run. The Stings forced eight turnovers during that stretch while Caden McKenzie fired in five 3-pointers to give Texas City the 16 point lead. While Texas City built a comfortable lead at intermission, things got uncomfortable for the Stings in the third quarter as the never-say-die Mustangs began their come back effort. With less than two minutes to play in the game, the Mustangs cut the lead to 62-54, but Texas City went on a 7-0 run to put the game out of reach down the stretch. "We battled back. 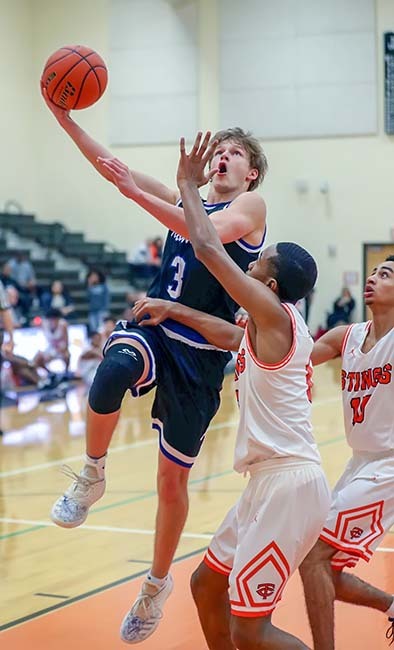 I was proud of the kids for the resiliency they showed and how hard they fought in the second half," Friendswood head coach Caleb Marburger said. "We won the second half, but a 19-point lead at halftime is tough to come back from. We got it inside 10 at a couple points in the fourth. "We were right there. We didn't finish a couple of shots right around the rim, had a couple of empty possessions with a couple missed free throws here and there — just the little things that add up, and they didn't add up for us tonight." Ian Bivins led Friendswood with 15 points and five rebounds. Hudson Bockart chipped in 11 points while Thomas Hamre had eight points. Friendswood will host Ball High on Friday, February 1 at 7:00 p.m. in a critical district clash.